For many visitors, Maui will always be known for its resorts, fine beaches, snorkeling and whale watching, Haleakala, and the Road to Hana. Maui is much more, however, and a great way to see some of the other Maui is to drive through Upcountry. The drive starts at the North Shore town of Pa'ia, continues through the paniolo town of Makawao, to Kula known for its flowers, vegetables, and ranches and ends at 'Ulapalakua where you can have fresh Maui beef for lunch while sipping a glass of Maui wine. 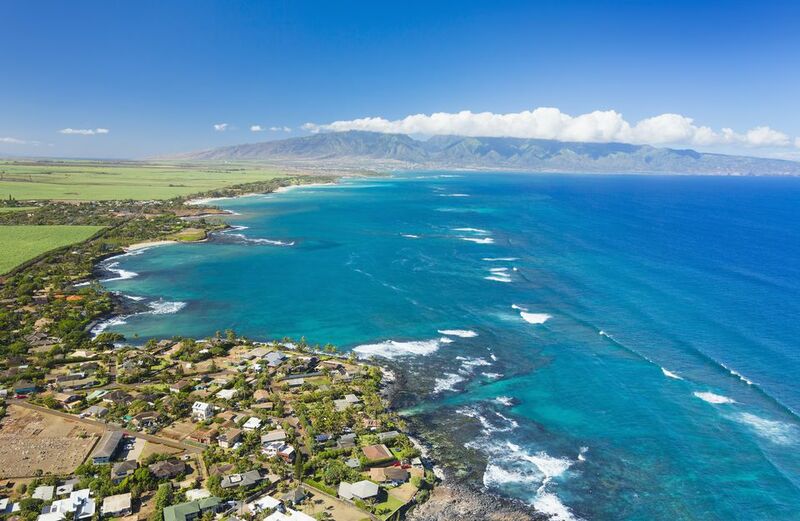 Pa'ia was a former plantation town when sugar was king on Maui and then became largely forgotten until the 1980s when the windsurfing craze brought thousands of the world's best windsurfers to nearby Ho'okipa Beach, known as the "windsurfing capital of the world." Since then the town has become the center of activity on the North Shore. The buildings still look much like they did at the turn of the 20th century, but new businesses have arrived in the form of art galleries, craft, and curio shops, a great bakery, over fifteen restaurants including the fine Pa'ia Fish Market, where you can get a great meal for about 1/4 of what you'll pay elsewhere. As you drive into town on the Hana Highway, there's a municipal parking lot immediately on your right. You can park there, wander through town and easily be back to your car in less than an hour. If you arrive in the early morning, you'll likely see groups of bicyclers finishing their downhill ride from the summit of Haleakala. As you get back into your car, turn right onto Baldwin Avenue. As you leave town you'll still see the buildings of the old sugar processing plant on your right. You'll pass through pineapple fields owned by the Maui Land & Pineapple Company, which cans most of the mainland store-brand sliced pineapple that are marked Hawaiian Pineapple. The next town you'll come to is Makawao, one of the state's last paniolo towns. The paniolos were the first cowboys in the United States. Long before there were cowboys in the old west, paniolos came to Hawaii in the early 1800's from Mexico to teach the Hawaiians how to herd cattle. If you pass through town on a weekend you may find a rodeo going on. One of Hawaii's most popular is held here each July 4. Parking can be tough in Makawao. If you're lucky you'll find a spot right on Baldwin Avenue where you can stop while you walk through town. Makawao retains much of that paniolo flavor in the facades of its buildings, but on the inside, you'll find lots of art galleries, boutiques, craft stores and eateries sitting right next to stores where the locals shop. Makawao is not just for the tourists. It is the nearest town for many locals for groceries, haircuts and even paniolo gear. You'll want to stop by the Casanova Deli or Komoda Store for some fresh pastry and a cup of coffee before you head further along the road. You'll want to bear right onto Makawao Avenue (Highway 400) as you leave town. The drive from Pukalani to Kula will take you past many local homes and some beautiful country with plenty of flowers everywhere. When Highway 400 ends you'll want to bear left on Highway 37, the Haleakala Highway. You'll soon pass the turnoff for Highway 377, which is where you would turn if you were headed to the summit of Haleakala. Don't turn; just keep driving along Highway 37. You'll be entering Kula which in Hawaiian means plain, field, open country, pasture. It also lets one know that it is dry-land farming, rather than wetland farming country. The name also means source, and Kula, Maui is the source of most of the island's produce from the farms. Indeed, at an elevation of approximately 3000 feet, Kula produce includes sweet Maui onions, lettuce, tomatoes, and potatoes. Kula is also abundant in eucalyptus and flowers of many varieties. Most of the carnations used in leis throughout Hawaii are grown here. You'll also find proteas, orchids, hibiscus, and jade vines. Upcountry Maui's rich agricultural history dates back to the early Hawaiians, who grew taro and sweet potato. The Hawaiians switched to Irish potatoes to supply the whaling fleets that arrived in the early nineteenth century and the locals have continued to adapt to new crops even to the present time. If you have time, stop by the Holy Ghost Church. Father James Beissel and his mostly Portuguese parishioners built this octagonal church in 1894. It features a decorative hand-carved wood altar given by the King and Queen of Portugal to the Portuguese plantation workers of Maui. As you pass the Kula Elementary School on the right, you will soon approach Rice Memorial Park on the left. Take the 2nd left after Rice Park onto Junction 377 East. Drive about 1/4 mile, and after rounding a bend, take a quick right up Waipoli Road. Proceed to the top of the road, turning right before the cattle guard onto the cement driveway. Follow the signs to the Alii Kula Lavender Farm. Where protea once grew, Alii Chang began to grow lavender very much on a whim when a gift of a lavender plant was given to him. Amazed by how well it grew on the slopes of Haleakala, Alii soon bought up all of the lavender plants locally available and ordered more. Today 31 different varieties of lavender grow on the farm and bloom abundantly in the months of June, July, and August. Why lavender? Through the years, lavender has been known to calm nerves, relieve stress, headaches, and insomnia, ease depression, uplift the spirit and arouse passion. Lavender has a slightly earthy, fresh-from-the-fields scent that appeals to both men and women. It's one of the few floras that are the least allergenic, and so versatile it is used in lotions, candles, foods, perfumes and aromatherapy products. When visiting Alii Kula Lavender it's best to call ahead and book a tour. They offer a walking tour, a cart tour and a picnic lunch tour. The garden tour lasts about an hour and is well worth your time and money. You will be amazed by how each of the 31 different varieties of lavender smell so different. Each type of lavender is used for a different product. What makes good lavender for lotion will likely not be appropriate for food items. Throughout the garden, you will see various proteas - the flowers grown on the farm before lavender. You'll also get to see and smell other types of plants grown on the property. The tour concludes at the studio gift shop where you can purchase numerous products made with lavender. A visit to Alii Kula Lavender is well worth your time. Nowhere else in the world can you see so many varieties of lavender. You will be amazed by the multiple uses of this plant, whose history dates back over 2,500 years to the people of Arabia, Egypt, Phoenicia, and ancient Rome. When you leave Alii Kula Lavender, retrace your route back to Highway 37 and bear left to head further south. Stay on Highway 37 all the way to the town of Keokea. Pass the Henry Fong Store on the right, and continue 5.1 miles to 'Ulupalakua. Your next stop will be Tedeschi Vineyards and Maui's Winery. The winery is just past ranch headquarters and the 'Ulupalakua Ranch Store. The area of 'Ulupalakua has an interesting history. In 1845 King Kamehameha III leased Honua'ula - an approximately 2000 acre portion of the great district we know as 'Ulupalakua - to L. L. Torbert for the purpose of growing and processing sugar cane. In 1856 Captain James Makee acquired the "Torbert Plantation at Honua'ula" which included the land, sugar mill, buildings, implements, and more than 1600 head of livestock. The Captain moved to Maui and named his new home "Rose Ranch" after his wife Catherine's favorite flower, Maui's Lokelani Rose. The ranch quickly became one of Maui's showplaces - famed for its hospitality as well as its agricultural prowess. In 1874 King David Kalakaua, the Merrie Monarch and his Queen Kapi'olani first visited Rose Ranch. The King became so frequent a visitor, a cottage was built for him on the property, which still exists today as is the site of the winery's tasting room. In 1883 the last sugar crop was processed at 'Ulupalakua Mill and the area became a working cattle ranch. After changing hands several times over the next eight decades, current owner C. Pardee Erdman purchased the property in 1963 and named it 'Ulupalakua Ranch. In 1974 Tedeschi Vineyards was established on ranch land leased to Emil Tedeschi, a Californian vintner. While waiting for their first grapes, the winery experimented with pineapple wine and in 1977 released their Maui Blanc Pineapple Wine. In 1980 the first grapes were harvested and in 1984 Tedeschi's first grape product, Maui Brut was released. Today the winery sells an assortment of wines made from grapes as well as several other specialty wines made from pineapple, passion fruit and even raspberries. Their top-selling Maui Splash is a light and fruity wine made from pineapple and passion fruit. Your first stop when you arrive at the winery should be the tasting room, where you can sample the various varieties of wines. The tasting room is open seven days a week. The guides are well versed in the history of the area and the ranch, and you'll enjoy walking through the grounds where Hawaiian royalty once relaxed along with Captain Makee's other famous guests. After the tour head back to the tasting room to buy a bottle of wine for lunch and maybe a few more to take with you. For lunch, all you need to do is walk across the street to the 'Ulupalakua Ranch Store. First opened in 1849 during the Polk administration, the 'Ulupalakua Ranch Store is the closest place to eat lunch, and you won't find any better place in Upcountry. Inside the store is a small deli where you can order prepared deli sandwiches or grilled sandwiches using meat from the ranch, including fresh beef or even elk. You'll never find fresher beef than here and the sandwiches are grilled to order on the outside veranda. While your lunch is being prepared, be sure to wander through the store and look at some of the interesting signs on the wall. When your lunch is ready you can eat right there on the veranda or take it back over to the winery grounds where you can enjoy it with a bottle of cold wine. After lunch, it's time to reverse course, but there's one more stop to make before the trip is over. As you head back down Highway 37 through Kula, keep your eye out for Omaopio Road on your left. Turn left onto Omaopio Road and go about a mile and a half until you see signs for the Surfing Goat Dairy. Looking for new direction in life, the Thomas gave up his software company and Eva left her job of teaching high school German. While Thomas worked on the financial planning Eva set out to learn the craft and secrets of cheese making from Europe's best. Working at and visiting dairies throughout Germany, Austria, and France, allowed her to develop a mental image of the type of dairy that she wanted to run and cheeses she wanted to produce. They made that image a reality over the past years. You won't find two more interesting people on Maui and you'll be amazed how they address each of their goats by name and talk knowingly of each goat's habits and preferences. Why "Surfing Goat Dairy"? The answer becomes obvious when you not only see the surfboards in the goat pens but also see goats standing on them as if waiting for the next wave. Surfing Goat Dairy produces more than twenty different cheeses ranging from cream cheeses like "Udderly Delicious" a plain salted Chevre to more exotic varieties like "Mandalay" (apple bananas and curry), "Pirate's Desire" (anchovies and capers), or "Maui's Secret" with fresh Maui pineapple. The Dairy also produces several soft-cheeses, including soft-cheese ripened under wax, in olive oil with garlic, or coated with mesquite ash, along with brine ripened feta cheese. They also produce soaps made from goat milk. All of their products are available at the dairy or online for shipment. You can also find these cheeses at numerous retail centers on Maui. Their products are also offered at many of Maui's finest restaurants. As you leave the dairy and head back to West Maui or the Kihei/Wailea area, you should feel content and proud that you have seen an area of Maui that most visitors never venture to go. It can also be nice to have a day away from the crowded resort area, in a part of Maui where the pace of life is slower, the weather cooler and where the beauty of the Valley Isle is everywhere to be seen.